One of our favorite foods is Skyline Chili. It’s a regional delicacy for Southwestern Ohio. Specifically from Cincinnati. 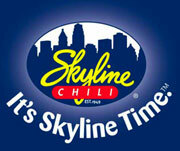 There are many brands of “Cincinnati-style chili” but we like to think Skyline is the best. (Of course, Chi might tell you it’s Empress Chili… but I’m sticking with Skyline.) Over the years I have taken a recipe for Skyline chili that I received from (I think?) my mother-in-law, through my sister-in-law (Jen’s entire family are Skyline afficionados…) and added, subtracted, monkeyed with, and attempted to match the real deal as best I can. I’m close… but still not quite there. Still… it is a fantastic thing that I can make GALLONS of Skyline-like Chili in my own house!!! Well, this weekend, we’re headed to Clarence for a little family party (celebrating the graduation of one of our neices, among other things). It was requested that I make and bring the main course – Skyline Chili!!! There are many things being celebrated this weekend. There’s Megan’s graduation. 🙂 And a church that my in-laws have lent their musical and preaching talents to on numerous occasions is celebrating 100 years of existence. So we’re celebrating that with them. My in-laws will be leaving soon for their summer travels, so it will be a good-bye party of sorts… and since they’ll be gone for my father-in-law’s birthday and their anniversary (same day), I’m sure we’ll be celebrating that too….. But that just wasn’t enough. My mother-in-law is very gifted. She can play the piano like nobody’s business. She has probably sewn (or do you just make?) THOUSANDS of quilts in her lifetime. She can sew anything. AND, she can cook. Add to that the fact that she loves to do all of those things for people, and she keeps herself pretty busy! 🙂 Well, she had been trying to have the Holcomb family over for dinner, where our family could join them – and we’d get to meet a (former) Buffalo Bills, NFL QB! So, that’s part of what we’re looking forward to this weekend. I’m sure I’ll have some kind of a report here by Monday. Hope your weekend is full of Skyline, family celebrations and milestones, and meals with NFL QBs also!! That got me hungry, I might go have skyline right now. Be Right Back. Of course, we also visit the REAL Skyline anytime we drive to/through Ohio!